A RINGING LEGACY IN CAPE GIRARDEAU AND BEYOND. Our church was founded on March 1, 1835, when Rev. J.F. Cowan from Apple Creek Church met with eight members in the home of Captain Ezra Dutch. The first house of worship was built and finished in 1854 and was located on the site of the rear half of our present church. It was a two story building used for Sunday worship and by the Cape Girardeau Academy for Boys during the week. The same ground floor was used to house one of Cape's Public Schools for many years. In 1912, the first public high school class, to be graduated as a class, held the graduation ceremony in our church. In 1924, Boy Scout Troop 4 was chartered at First Presbyterian Church. Men of the church served as the first officers. In 1928, the Women of the Church organized Girl Scout Troop 1 with 15 members. Through the power of faith and prayer, members have endured many challenging times during this church's 175-year history, especially during the Civil War, World War I, the Great Depression and World War II. Members of First Presbyterian Church have accomplished what seemed to be such overwhelming, if not impossible, tasks to maintain the church's property and programming while also improving the quality of life for this community. Especially significant were the decade-long efforts to conceptualize and plan Cape's full-service retirement community—The Chateau Girardeau—which opened its doors in 1979. Through other dedicated efforts, our church has also been in on the beginning and ongoing operations of Meals-on-Wheels, FISH, Habitat for Humanity, and Safe House for Women. The bell weighs about 1,400 pounds. Originally made for a St. Louis church by Jones and Hitchcock, a foundry in Troy, NY, the bell was too heavy for that church. The bell was obtained for our church in 1855 with the help of donations from Addie McNeely, who gave $500 and Miss May Fergusin, who gave $100. It is believed that the bell was transported from New York by an ocean-going vessel and reached Cape Girardeau eventually by way of the Mississippi River from New Orleans. For years, the bell was used as a school bell. One day a young girl rang the bell so enthusiastically that she pulled the bell down and just missed being caught under it. Also used as the town's fire bell, it would be rung in a unique way for each of Cape's four wards. 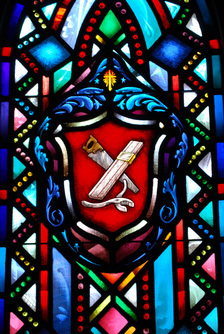 A committee of church members, developed the theme of each window in our historic sanctuary. 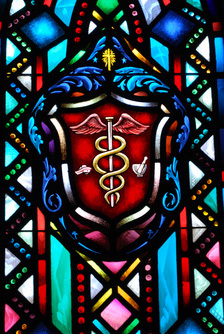 The artists and craftsmen of The Unique Art Glass Company of St. Louis, Missouri worked these themes into beautifully wrought stained glass. 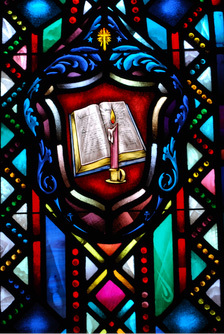 This is the window the congregation faces as they are gathered in the sanctuary. The window represents three symbols of Deity. 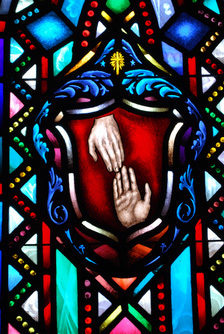 The first is Manus Dei, or hand of God. It perhaps sets forth, better than any symbol, God's search for man. 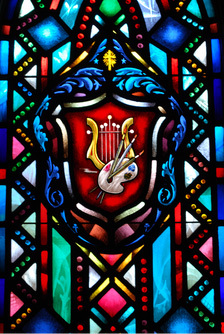 Agnus Dei, or lamb of God, appears in the second pane. One of the oldest symbols of Christ, it speaks of the redemptive Power of God. 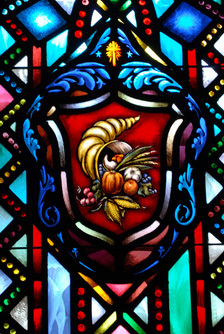 The final pane is the Dove, a symbol of the heaven-descended Spirit of God. When Christ was baptized of John the Spirit descended as a dove. Other symbols represented in the windows include a ship, the Ark of the Covenant and clasped hands. These represent the Church, God in the midst of His people and fellowship. Finally, symbols of "the Word and the Sacraments" appear in the form of an open Bible, a lamp, the shell, the cup and broken bread. This is the window which worshippers see as they turn to leave and start down the aisle toward the door. In the center there is a burning torch and it’s rays are seen spreading out in all directions. 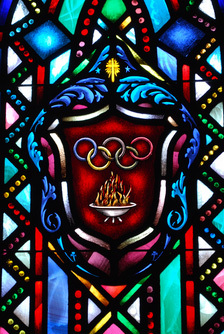 The burning torch is a symbol of the witnessing of Christians. 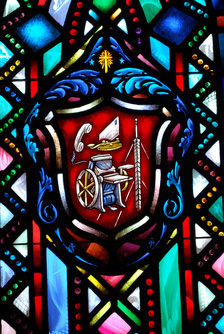 The symbols in these windows are intended to represent and to suggest those areas in which people move, earn their livelihood, and express their faith. A Christian expresses his faith not only in corporate worship but also in the varied areas which he moves – he should not be a Christian and a workman, but a Christian workman. These symbols are also intended to suggest all the worthy occupations and activities in which those who come to worship participate. Since one occupation or activity may have numerous facets, there is unavoidable over-lapping and one with a little imagination may find himself represented by more than one symbol. It is hoped that all with a little imagination may find themselves in at least one. The Saw, Slide rule and Pliers should suggest the crafts, building trades, engineering, installation, repair and maintenance. The Printing Press, Telephone, Telegraph Key, Letter and Antenna should suggest the many forms of communications – radio, television, printing, telegraph, mail, speakers, announcers, operations & attendant management and services, etc. The Candle and the Book should suggest education, both teaching and learning, instruction, research, preparing others to teach, preaching, library work, schools, school management, associated personnel, etc.